These conveyors are designed in compliance with the international quality standards, under the supervision of our team of experts we ensure full turnkey compliance .Fully Automated feeding Automated Steel and Non Ferrous Bars and Tube Handling Systems , with high Precision for Hardening and Tempering Lines Non Destructive Testing Systems such as Ultrasonic and Eddy Current Testing System for Continuous Testing for diameter ranges 5 mm to 250 mm. Our range is used to convey Metal Tubes, Bars and form a critical input to the Non Destructive Testing of Bars and Tubes, reaching high production rates in automatic as well as Manual Mode up to 120 m/min line speed. The System includes Bundle Unscrambing System, Bar loading System , V Roll Conveyors , Test Bench , Dual and Triple Pinches , Sorting System and Belt Pockets or cradles. 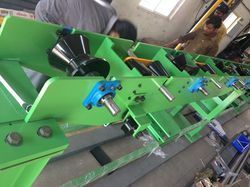 The System includes Bundle Unscrambling System, Bar loading System , V Roll Conveyors , Test Bench , Dual and Triple Pinches , Sorting System and Belt Pockets or cradles. V Roller conveyors are employed for handling long products such as tubes or bars in final operations such as Heat treatment lines or Non-Destructive testing lines. 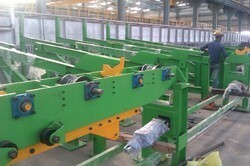 These conveyors are very accurate and are long lasting. Minimum pressure accumulation, however, allows the products to make contact, but with a determined degree of impact that will not cause damage. Roller conveyors are mechanical devices that use small metal tubes placed adjacent to each other for transporting large goods and materials. Roller conveyors are the best choice if you want to handle side loads, push off, accumulate products, and adjust pressure on rollers. · Industrial applications, warehousing and freight handling, and movement of raw materials. · Roller conveyors are also used in various industries to move packaged goods, assemblies, process byproducts. · They are also used to move materials over short distances such as in heavy industry, food and beverage processing industry, and manufacturing industry. · Roller conveyors are also utilized in airports, mines, cement plants, and distribution facilities. We offer a variety of Tube Handling Systems that can accumulate, sort and stack the tube. Without an effective tube handling system, downstream bottlenecks can reduce production rates. We have developed conveying systems for short parts, long parts or mixed-length. Our basic run out tables provide an area to accumulate, inspect and sort tubes. · Easy arrangement of products according to their classification numbers. · Many different businesses working in harmony at the different stages of transport and storage. Looking for Handling Systems for of Bars Tubes Plates ?